The cover of the Pinnacle 1975 edition. All these years later, it still makes me smile when I find it for sale in a used bookshop. I was a sophomore journalism student at West Virginia University and a budding Sherlock Holmes nut. 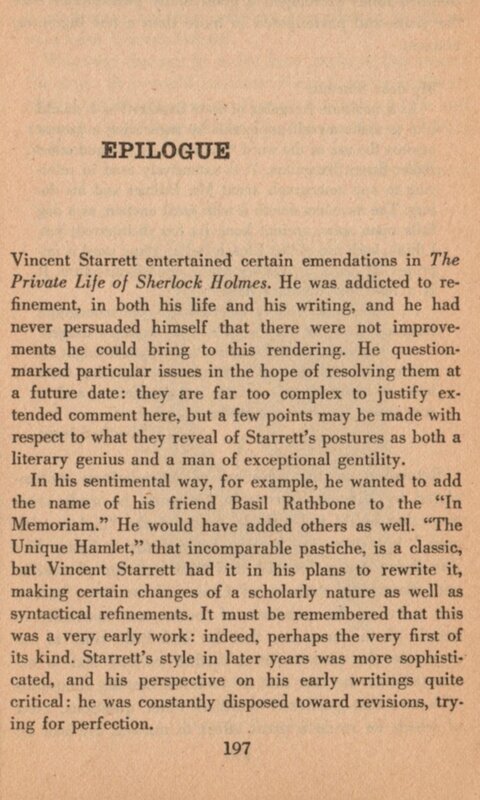 Before going to college, I had read Vincent Starrett’s book, The Private Life of Sherlock Holmes at my community library, back in Pennsylvania. There was a chapter about the Baker Street Irregulars, a witty band of Holmes fans who laughed and drank their way through meetings dedicated to Sherlock Holmes. It was my fantasy come to life, and while it was outside my reach, I enjoyed knowing there were those who held the same passion as I. Back to WVU and 1975. I was walking through the University Bookstore. (Morgantown, W.Va., had two new book bookstores and three used and rare bookshops at the time. Talk about a fantasy come to life!) On a shelf marked “Biography” I saw a new paperback with a familiar title: The Private Life of Sherlock Holmes. I couldn't believe it. Could it be? I picked it up and flipped through it. The author’s name was right, and some of it was familiar, but some of the chapters were new to me. Then my eyes caught a chapter I had never read before: “The Private Life of Vincent Starrett” by Michael Murphy. I knew almost nothing about Starrett and this was the opportunity to change all that. I scrounged through the pocket of my jeans, came up with two bucks and headed for the register. 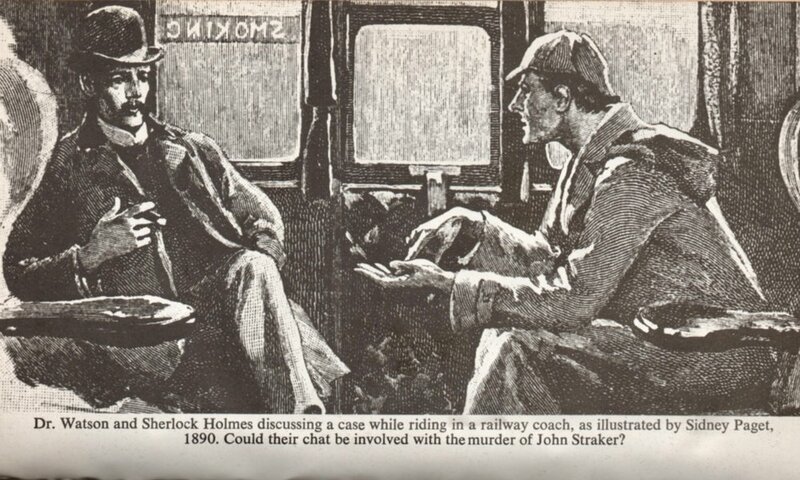 And that is how in 1975 I purchased my first copy of The Private Life of Sherlock Holmes. Now, some 43 years later, I have what I believe to be a copy of every major edition of Private Life, 14 by my count. But this one, this paperback is special. It was the first I ever owned. The copy I purchased more than 40 years ago is long gone. I literally read it to pieces. I own another (well, a couple) and I still pull it off the shelf every once in a while to relive that memorable day. What strikes me today is the fact that other editions of Private Life were written for those in the public who likes to read the Sherlock Holmes stories or watch/listen to the various adaptations. This edition is different. It was edited for Sherlockians. There’s a lot more to say, but first, let’s look at the book. Pinnacle Books, New York City. First printing, August 1975, stated. 208 pages. Decorated wrappers. 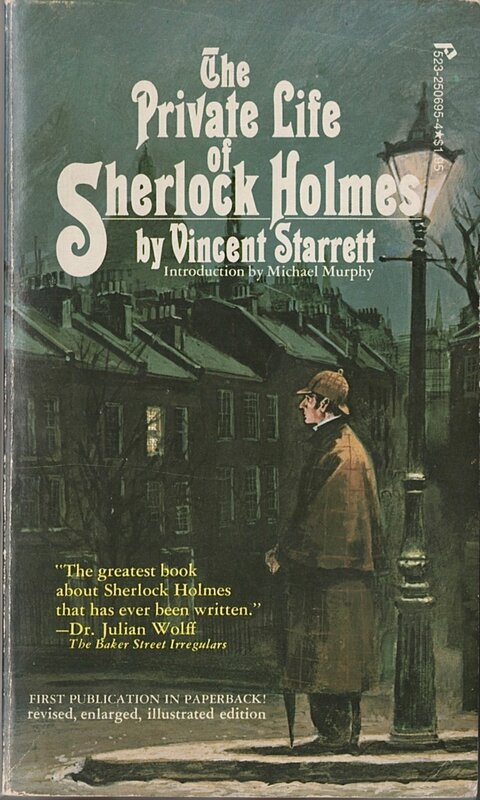 Cover illustration shows Holmes in deerstalker and cape holding an umbrella while standing underneath a gas lamp and looking across to a line of three-story row homes at twilight. Spine: “Pinnacle Books/biography” at head; “The Private Life of Sherlock Holmes Starrett” horizontal on spine; “ISBN 0-523-00695-0 195” at tail. Blurbs and a “Note” on back. This is a truly “revised, enlarged and illustrated edition,” and in many ways makes good on the unfulfilled promise of the 1960 edition. A new 4-page Introduction by Michael Murphy, Starrett’s friend. 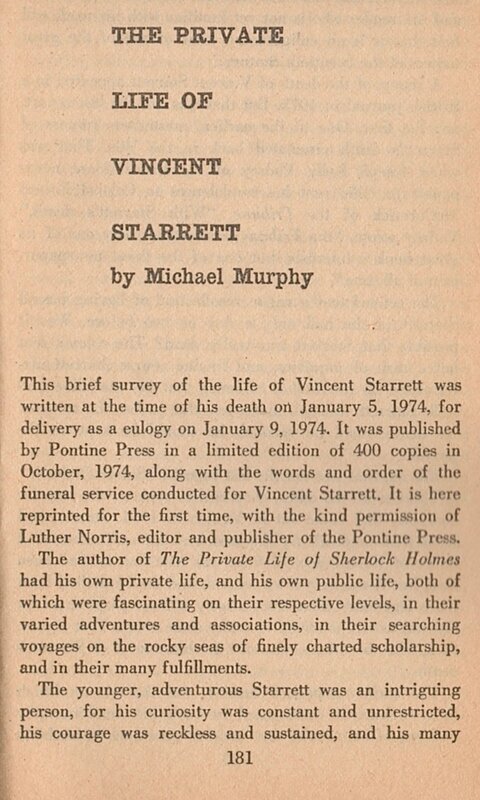 Murphy idolized Starrett and clearly saw this as an opportunity to promote the dean of Chicago Sherlockian’s work to a new generation. 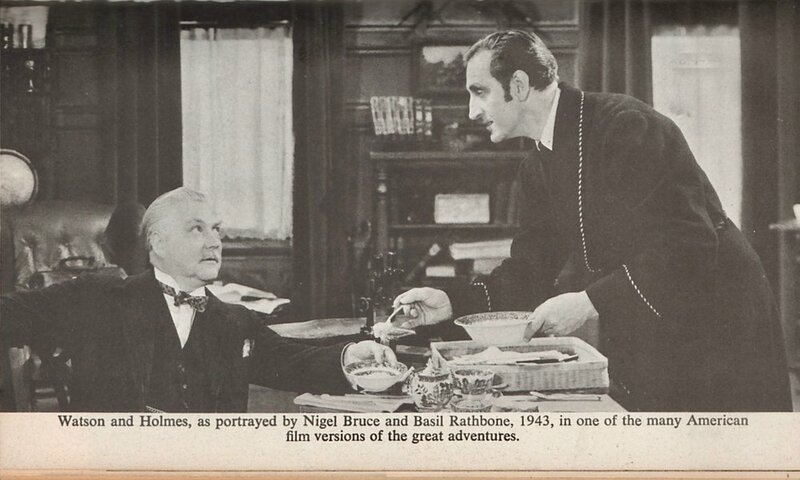 New photographs, including one of the Sherlock Holmes Pub on Northumberland, with an inside shot of three playbills of Sherlockian plays; the famous Paget illustration showing Holmes and Watson in a train car, with a promotional photo from the 1943 film “Adventures of Sherlock Holmes,” showing parallels between the two; a signed photo of Rathbone as Holmes; and three photos of William Gillette as Holmes. There’s also a bonus photo: a shot of Starrett from his time as a war correspondent in Mexico. 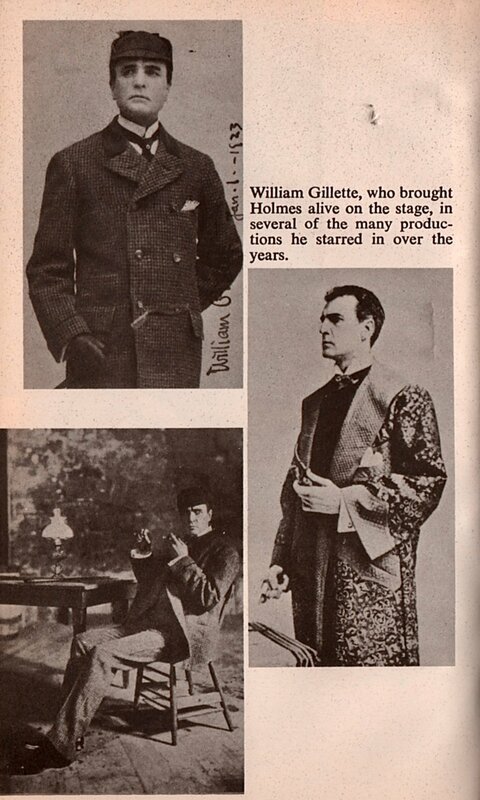 Granted a few of the photos from the 1960 edition are missing, but the goal here is clearly to illustrate the points Starrett is making in his essays, hence the emphasis on Paget, Gillette and Rathbone. But the real treat started on page 181, in an essay delightfully titled, “The Private Life of Vincent Starrett.” Murphy wrote this too. In fact, he wrote it after Starrett’s 1974 death for a privately printed pamphlet produced by Luther Norris and his Pontine Press. In 16 pages, Murphy solidifies the Starrett legend as only a true acolyte can. 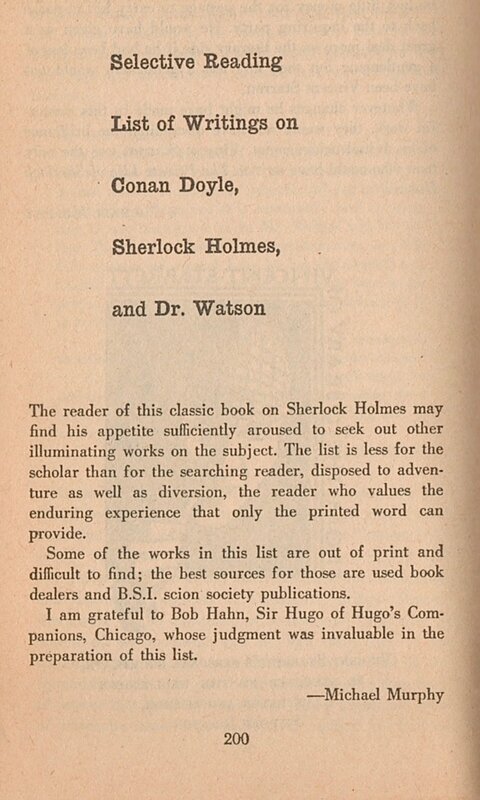 Then we get a final gift: a new essay titled “Selective Reading List of Writings on Conan Doyle, Sherlock Holmes and Dr. Watson.” In the 1933 edition, Starrett offered a bibliography, literally a catalogue of the best items from his personal Holmes collection. Edgar Smith, among others, used this list as a guide to their own collecting. 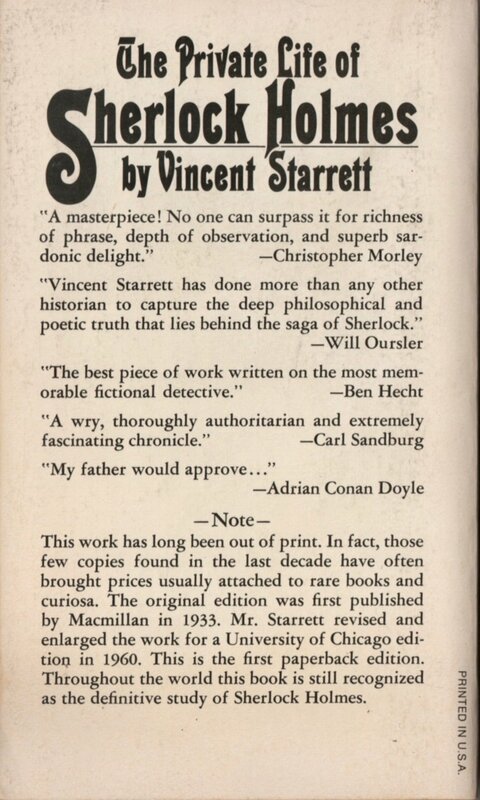 The books in Starrett’s original list were, by 1974, priced out of reach for younger Sherlockians. Now, for a newer generation, Murphy suggested a series of books, periodicals and criticism. For years, I tried to get the books on Murphy’s list. It would remain my guide until John Bennett Shaw issued his own list of the 100 volumes necessary for the “basic” Holmes collection. Except for a few headshots, this was the first photo I saw of Vincent Starrett. It’s remained a favorite ever since. I will be writing a bit about his war experience in 2019. I can’t tell how you exciting it was to open up this book for the first time. For example, on the first page, the front free endpaper, the was a three paragraph note that began with, “THE SACRED WRITINGS.” While not signed, the note has the flavor of other parts of the book written by Michael Murphy. I want to be an Irregular someday. Looking back, I have come to realize that for some of us, this wasn’t just a series of essays on Holmes. It was a training manual for the next generation of American Sherlockians on how to become Irregulars. I’ve talked with others who have been influenced by this book at a particular point in their Holmes affiliation, and they agree: We didn’t just read this book. We internalized it and started to emulate the descriptions found there. It became our primer with Starrett as the professor, and Murphy as the TA. I’ve been asked in recent months which copy of Private Life I would recommend newcomers pursue. While the romance of the 1933 is not equaled in later editions, the new material in the Pinnacle edition makes it a cornerstone Starrett work. And the added bonus is that while used copies of the Pinnacle paperback can’t be picked up for the original $1.95, there are many for sale at very reasonable prices. Get one. I hope you find the same pleasure in it that I did four decades ago. Final thought No. 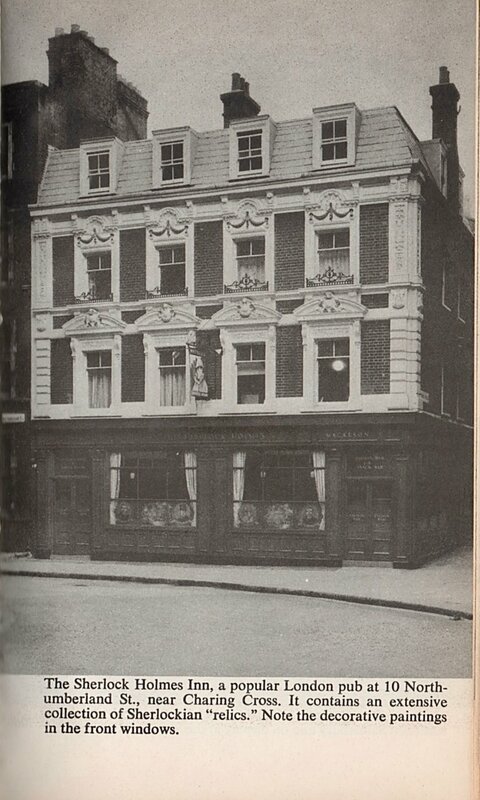 1: I have neglected so far to mention that Starrett’s immortal sonnet, “221B” is published here. This volume then becomes the Starrett-Sherlockian trifecta for placing “Unique Hamlet,” “221B” and Private Life all in one space. That’s another reason why this edition should be on your shelves. It’s also is why Pinnacle should consider a reprint, even after all these years. Final thought No. 2: People have asked me why I am spending so much time and energy on one book. The reason is simple: I hope that just one person stumbles across this blog, finds a copy of Private Life and has the same reaction I did. Then it would all be worthwhile. One of many glorifying tributes Michael Murphy pays to Starrett. Next Time: The Book That Never Was.